Pure unveils Contour D1 digital radio dock | What Hi-Fi? 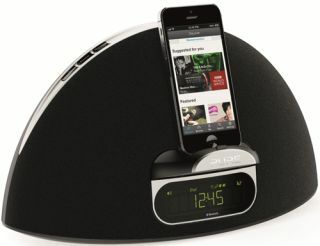 Pure has introduced the Contour D1 digital radio dock with Bluetooth streaming as well as both 30-pin and lightning connectors for Apple devices. The Contour D1 is Apple certified and features a revolving dock with clip-in adaptors to accomodate both new and legacy iPods, iPhones and iPads. Users are also able to stream audio content from Bluetooth-enabled mobile devices and listen to digital radio. BLOG: The rocky road to digital radio switchover - will it ever happen? The Contour D1 is compatible with Pure's free Connect app which grants access to more than 20,000 global internet radio stations, 200,000 free on-demand programmes and podcasts and millions of streamable tracks from Pure's subscription music service. Pure claims the Contour D1 provides "high-clarity, room-filling sound" with 20W RMS of power. Nick Hucker, Pure's director of marketing says: "Contour D1 offers the best possible flexibility for all the family with a choice of docking old or new Apple models, listening to a wide variety of digital radio stations or playing music wirelessly from the comfort of the sofa, regardless of Android or Apple ownership." The Pure Contour D1 is available now for £150.